#19. 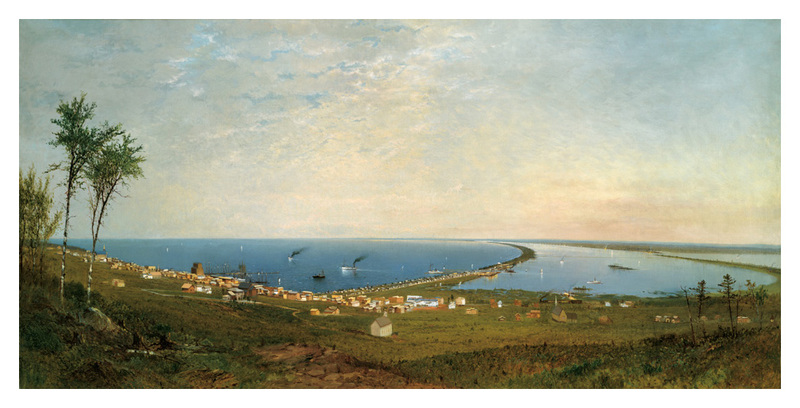 Duluth 1871. 25 x 50, oil on canvas. "Gilbert Munger 1871" lower left; the back is currently covered. The view is of the harbor and breakwater looking south from downtown. According to a plate once on the frame, this painting was given to the City of Duluth in 1917 by Luther Mendenhall, who was the first President of the Duluth Library Association in 1869. The painting was at the Duluth Public Library by 1949, where it still hangs. #86 is another version of this scene. IAP 83850031. QFD 8. See Painting and Sculpture in Minnesota by Rena Coen, Univ. of Minnesota, 1976, p. 68. Image from Duluth Public Library photo.